I have wanted to read this one since I fell in love with the first and second books in the series, and I was so happy to get a copy from Harper Teen. 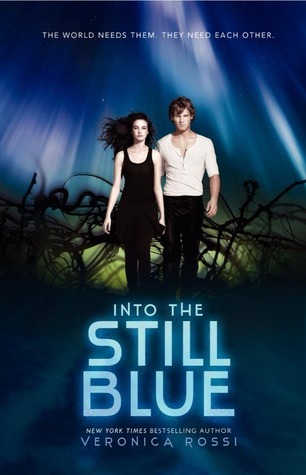 Into the Still Blue is one of my most anticipated books, and I was so glad when it was time to read it, and I was not at all disappointed. The characters that I grew to love are back and as awesome as ever. They have learned and grown a lot in the last two books, and I can see it still going on in this one. It was really amazing how they transformed, stepped up and discovered who they were as people, as leaders, friends and as a couple. Aria and Perry are one of my favorite book couples, and even though they have their issues, they end up back at this happy, romantic, and swoony place. Their trust in each other grows so much more in this one, and they are learning to open up and communicate more, which leads them to even higher places in their relationship. I love their moments together, the romantic tension and the hot moments. They are def making up for lost time and facing what could be death and even if they make it to Still Blue, what will certainly be a hard journey, not only physically but emotionally, from the loss of loved ones, to past hurts, and patching up relationships. I also love the interactions between Roar and Aria. Their friendship has come so far, and I like how they support each other, but that things are usually kept light and funny. It brings relief for the tension, but it also shows that friendship between guys and girls is possible, and can be beautiful. Soren, ah Soren. He was surly, but he is the character that I saw the most growth in this book. His sarcasm, and unnessesary remarks also served to make me laugh when Roar was too heartbroken to be his usual boisterous amazing self. The action is amazing as usual, and it was great to see the dwellers and the outsiders learn to trust one another and work together for their common goal--safety and happiness. The pacing is amazing as always. I never wanted to put it down, even when I was sick with the norovirus, I would read until everything went blurry and then picked it back up. I used my day off to rest and read, and this was a perfect companion and way to start the new year. The surprises and twists were enough to make me want to scream. Some really hard stuff happens, and while I understand why it had to happen that way, it still doesn't mean I didn't want it to, and that I didn't have open mouthed shock. There were a few things at the end that I kept waiting and waiting to change, because I couldn't live with the series if it ended in that manner. I know that it is all about testing and trying the characters, and I know they can't just have a lolly-dah this is beautiful third book, but its hard to read about these characters that I love being put through so much physically, mentally and emotionally. There are some twisted bad guys, and they went through unusual lengths to get what they wanted. The ending was fitting for this story, and I got closure. Some characters that I wanted desperately to live unfortunately didn't so I didn't get the complete happily ever after that I wanted, but I do feel like the plot is well wrapped up and resolved. Although I don't want to say goodbye to Aria and Perry. I love them as characters, I love their romance, intense, fiery, but also sweet and savory. Bottom Line: Bittersweet ending to a favorite series. How do you feel about end of series? I loved this series. Great characters, great story. Great review! What a fantastic end to the series! I really loved this one. Glad you did, too! I need to get back into this series, sooo bad! I'm so glad you enjoyed this one! I love Aria and Perry and thought that the romance in the book was so worth it! And I have to agree with you about Soren! I was so surprised at how he turned out. Great review! I remember I was so skeptical to start the series, but read both the first and the second last year and ended up dying to read the third. I think it was a pretty great trilogy! I haven't read this series yet :( so behind. Own book 1 thought. I always fear reading the final books because parting is bad enough without the author's ending making it worse but it seems like Veronica Rossi hit this one straight on the nail! I loved this book and thought it was a great conclusion to the series. I still need to read these! I hate when series I love end! I love it when characters grow throughout a series / trilogy - it makes the story so much better. I still have to read the second book, so I can catch up and read this. Glad that it was really good. This was actually my least favorite of the three, but Soren was the highlight for me too, and so was Aria and Roar's relationship. I'm so so glad you enjoyed it! I am with Maja, I liked it but not as much as book two. The whole situation with Cinder was too glossed over and it failed to make an impact. I am glad you felt you got closer. While not perfect it sounds like this was a good series. I loved this series as well, Brandi! I loved Perry and Aria together! One of my favorite YA couples. I kept waiting and hoping something would change in respects to Roar. I guess not everything can work out perfectly. I would love for him to have a spin off! It is an awesome friendship! So happy this was a good ending to the series. I have all these books I just need to get to them. Though I do hate when characters I love die. I'm so glad you enjoyed this! I loved the finale, and though I wish I had more time with the surviving characters, I was definitely satisfied. Awesome review! It's good to see that all the characters have grown so much throughout this series, and you could see so much of it in this book. Soren sounds like a hoot of a side character, but all the characters sound great. Awesome review!